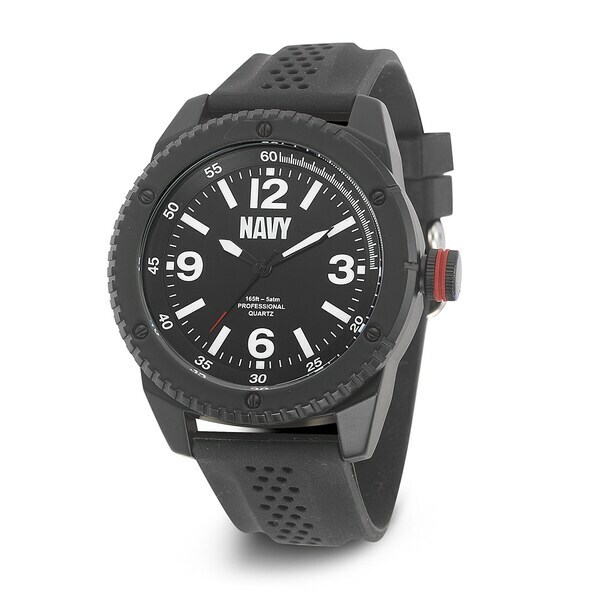 I think this is an exceptional watch to represent the US Navy. I liked it as soon as I saw it. The price was very reasonable compared to a few others that I saw. It seems to be well made, being that it is a little on the heavy side. I would recommend this watch to anyone that served in the Navy. Also would like to thank Overstock for another quality item that I have purchased from you!!! The men's Wrist Armor U.S. Navy C20 watch by Versil features a solid watch case with combination finish. This stylish watch also features a bold black dial with the Navy logo, sharp white hour markers, luminescent hands and is powered by a precision quartz movement. A black rubber strap adds style and comfort to this unique timepiece and weights approximatley 0.48 grams. It has the "Navy" on the face, its water resistant and rubber wrist strap.